On Friday, October 23rd, Pacific Ridge's 9th annual Field Day had the campus buzzing with competition, fun, and Firebird spirit! Teams spent the afternoon rotating through stations including a three-legged race, shuffleball, basketball shoot, and human tic-tac-toe. The faculty emerged victorious in the traditional faculty vs. seniors tug o' war, and a final tally revealed Team Black as the Field Day winners and keepers of the coveted Field Day trophy! 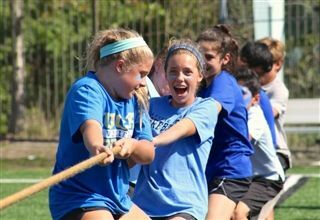 For more Field Day photos, please visit the Pacific Ridge Facebook page.